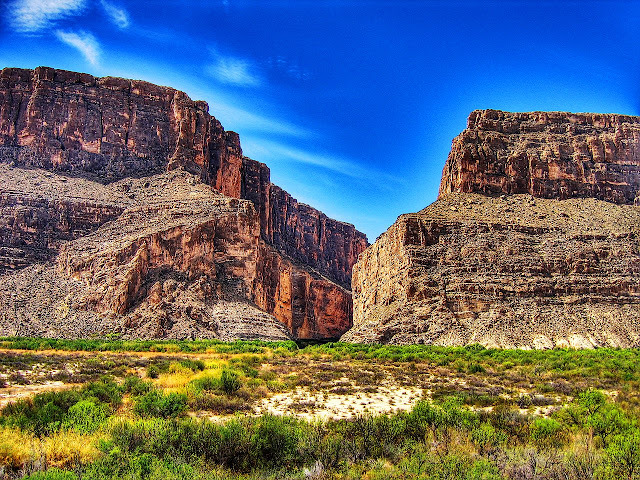 Santa Elena Canyon, The Most Dramatic Place in U.S. 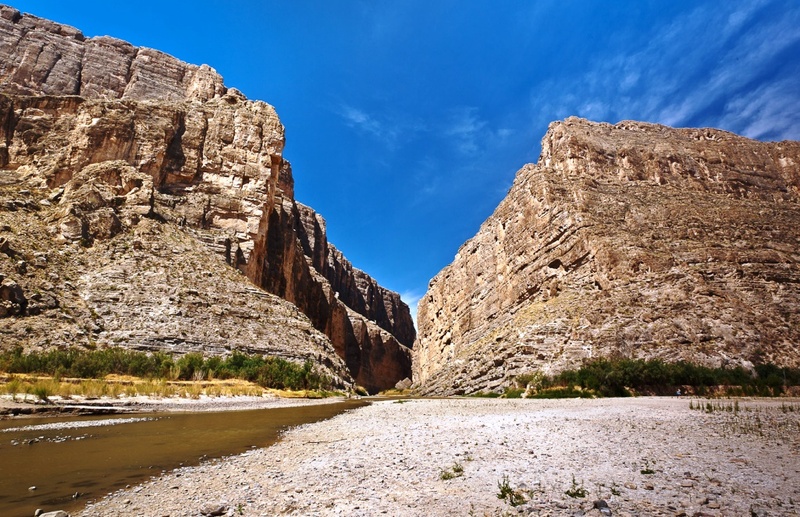 The lovely Santa Elena Canyon is most inspiring natural feature in Big Bend National Park. 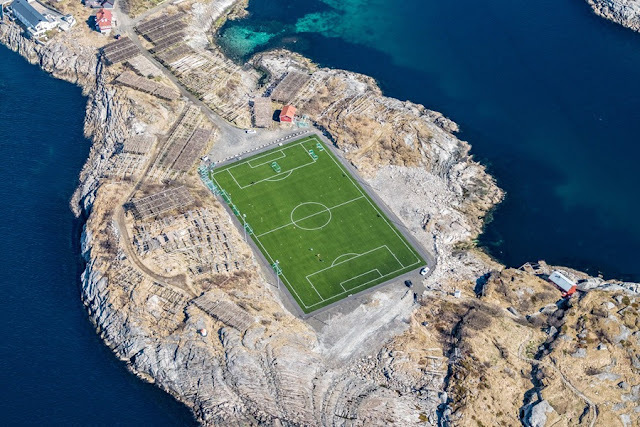 It is visible for more than 10 miles away cutting through the mountains via a deep narrow gorge. Santa Elan Canyon is quite a long distance 30 miles however a short nature trail enters its shady depths, eight miles west of Castolon, accessible by either Ross Maxwell Scenic Drive or the Old Maverick Road. Some are really quite winding and steep. Santa Elena Canyon downstream is most popular area for one to three day trip, easily accessed by car. It is often considered most dramatic place has the tallest cliffs forming the canyon wall up to 1500 feet. 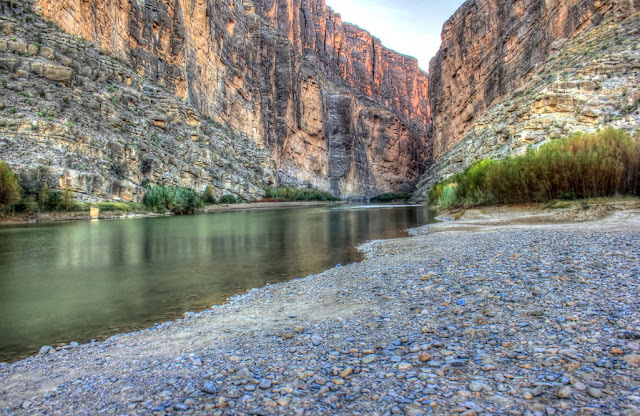 The nature trail crosses Terlingua Creek, climbs several flights of ramps and stairs and then descends into the canyon along the Rio Grande offers one of the few remaining true wilderness river trips in the United States. Side canyons create interesting vistas, as well as exploration opportunities. Moreover the area has an extremely dry and hot climate conditions, with temperatures up to 50 °C in summer with little rain. Further, there is a contrast between the desert and cold temperate ecosystems. You should keep in mind that during the rainy season, Terlingua Creek can flood and make access extremely difficult, so it is a nice idea to prior check with Park Rangers for current conditions. Local outfitters offer various trips when conditions allow, and river runners of intermediate or better skill level often go on their own. Hence, water flow is normally adequate for river trips except during periods of prolonged drought. In addition, beware of flash floods that can raise the river level and flow rates very rapidly after rainfall in the drainage basin, even if it does not rain at the river. 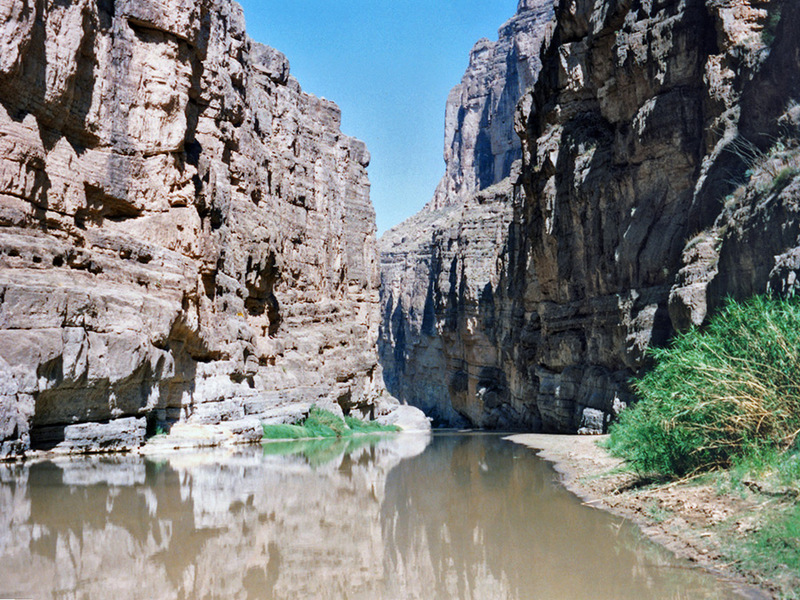 The low levels of water can prevent you from rafting along the canyon which is very popular activity here. Even a short distance is worthwhile the canyon feels much more remote and undisturbed once around the first bend when the entrance is out of view. Also stargazing is relaxing activity here as on the clearest nights, around 2,000 stars are visible to the naked eye. It is an outstanding place in North America for star gazing. 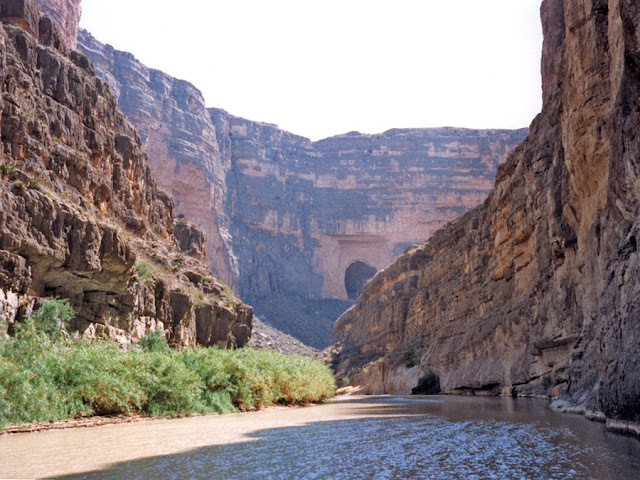 Santa Elena Canyon is majestic, towering canyon walls are much taller than in Colorado Canyon upriver a few miles. The scenery is remarkable, and there are numerous opportunities for wildlife viewing, hiking in shady side canyons and camping on spacious sandbars. The best way to see the canyon is by raft or canoe. 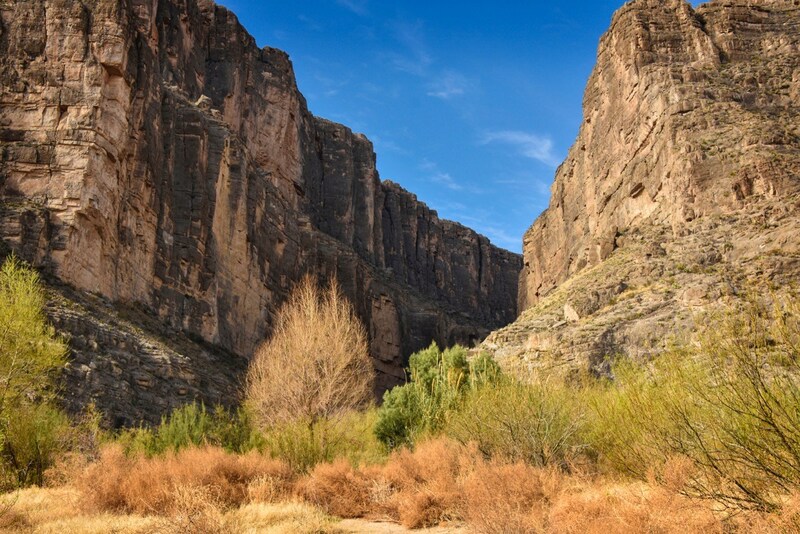 Another scenic, little visited location is Fern Canyon 18 miles below Lajitas, a narrow tributary just two miles from Santa Elena Canyon. This is very narrow and has a pretty white limestone floor, polished smooth by the waters that sometimes flood down the ravine. 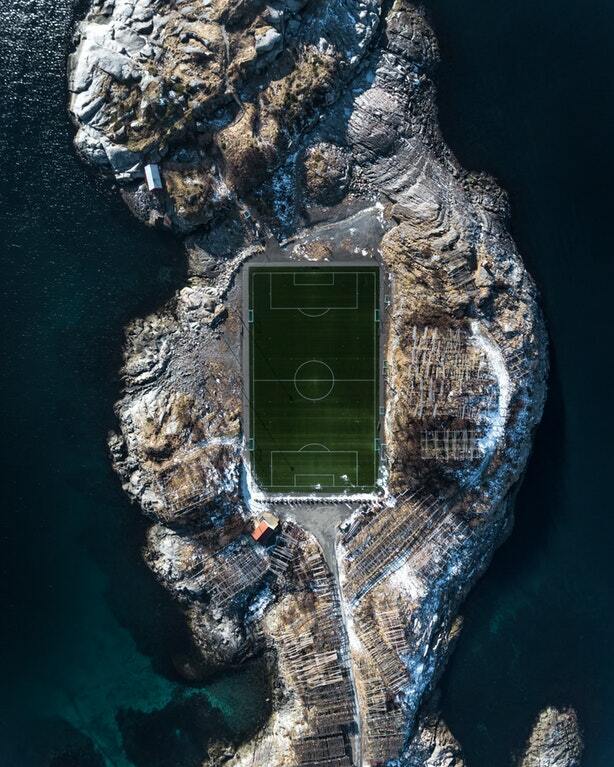 It is truly a majestic and gorgeous place to spend a few days. 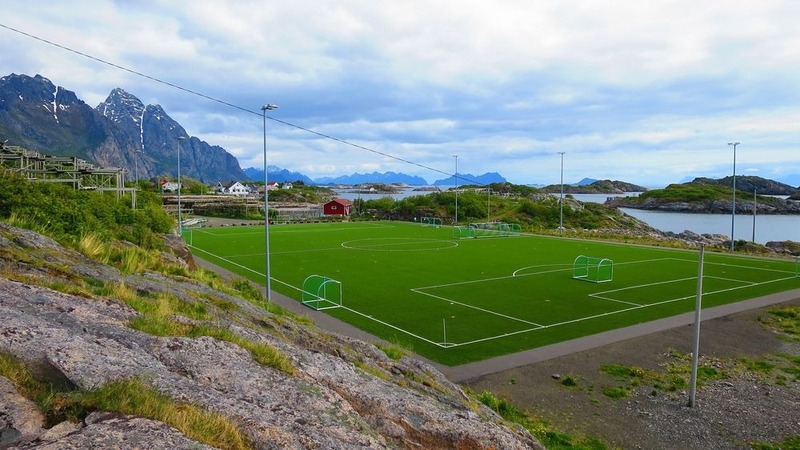 Due to the inaccessibility of the area it is generally best to be well prepared for any and all weather possibilities. The drive up to Santa Elena canyon absolutely breathtaking and it is amazing and once you park and start walking towards the canyon, your jaw just drops at the sheer majesty of it. Definitely a Big Bend must see/do hike. It is most photographed part of the Bing Bend National park. There is a massive boulder on the trail the size of a small house that is nice to sit under on a hot day. The rock formations rising on each side of the Rio are mesmerizing. It is highly suggest visiting the canyon in early November through mid-March. Which is generally the best time to paddle the Rio Grande? The area may be very crowded during holiday periods or during the winter "snowbird" season, which is also the time most likely to have favorable paddling conditions. Summertime low-water conditions may be inadequate for rafting, but canoes can almost always navigate the river. Moreover entrance permits to Big Bend National Park are required for all vehicles entering the park for river access. Also riverside camping is available just outside the canyon on the left side of river and right side of Mexican. Where ankle-deep Bermuda grass is covers the ground, making for a softer night's sleep. Firewood is scarce, if available at all, so carry what you need. Except for campfires, it is generally best to rely upon propane, butane or liquid fuel fires for cooking, personal hygiene and other general heating and cooking needs. Please keep in mind a fine may be imposed for camping in unauthorized areas. Santa Elena Canyon location is in the middle of the continent and along a migration route, is ideal for bird diversity throughout the year. 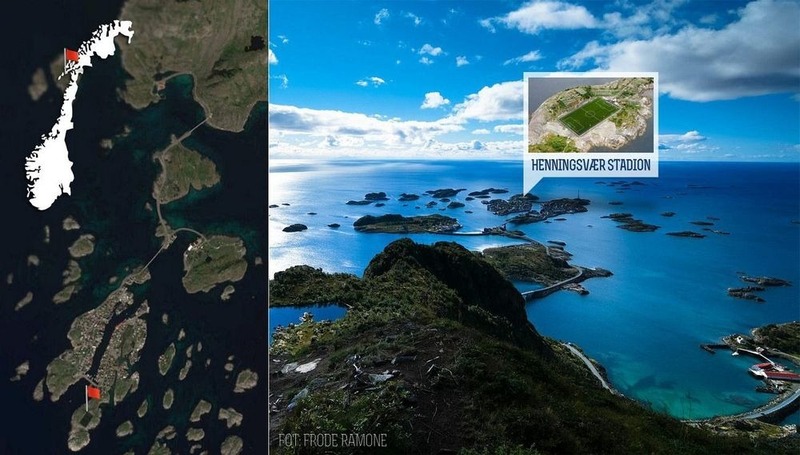 Northern species migrate here for the warm winter climate, while birds from the tropics range this far north to breed in the spring. One of major highlight is the Colima warbler, is a predominately Mexican species that only nests in the United States in the Chisos Mountains from April to September. Santa Elena Canyon River Trip is more complicated in the last seven miles while entering the actual canyon. 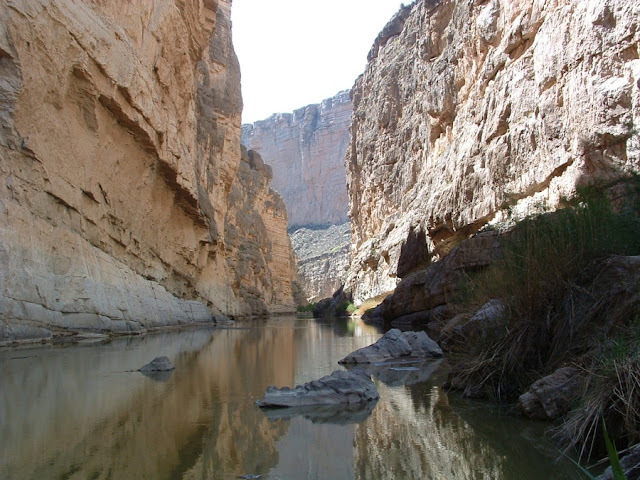 You can enjoy by paddling upstream from the Santa Elena Canyon Trailhead, just a few miles into the canyon, and then come back drown stream. There are a couple of rapids to watch out for, and the famed Rockslide can provide a challenge for even for experienced professionals. 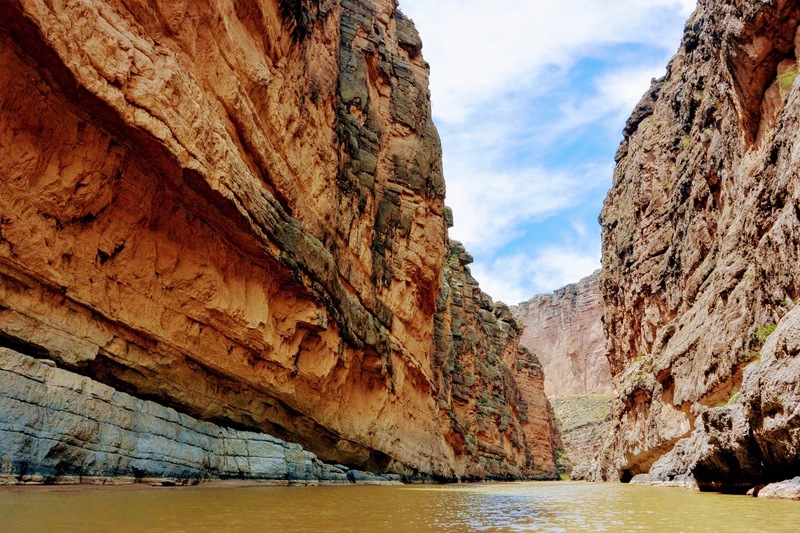 Santa Elena Canyon offers dazzling coves and remarkable side canyons that are a veritable feast for your eyes and your camera. So be sure to carry plenty of extra batteries. 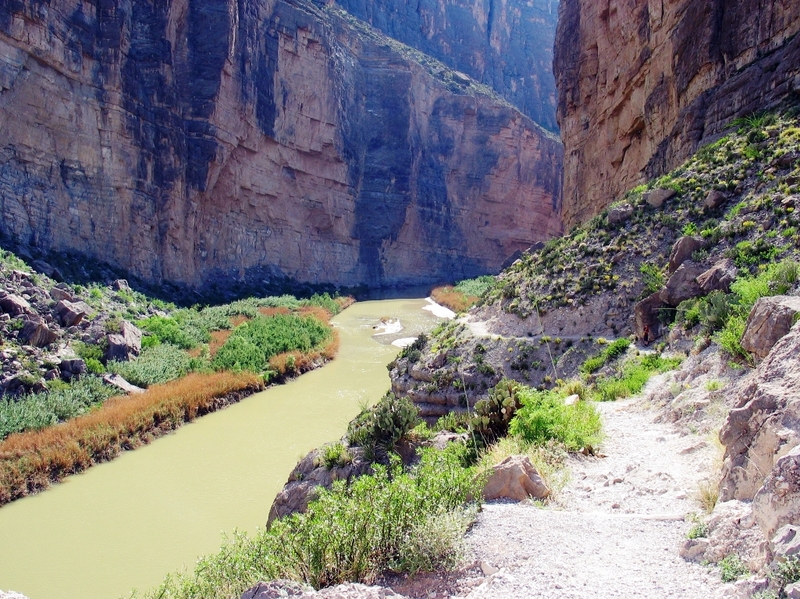 You may not want to leave Santa Elena Canyon. 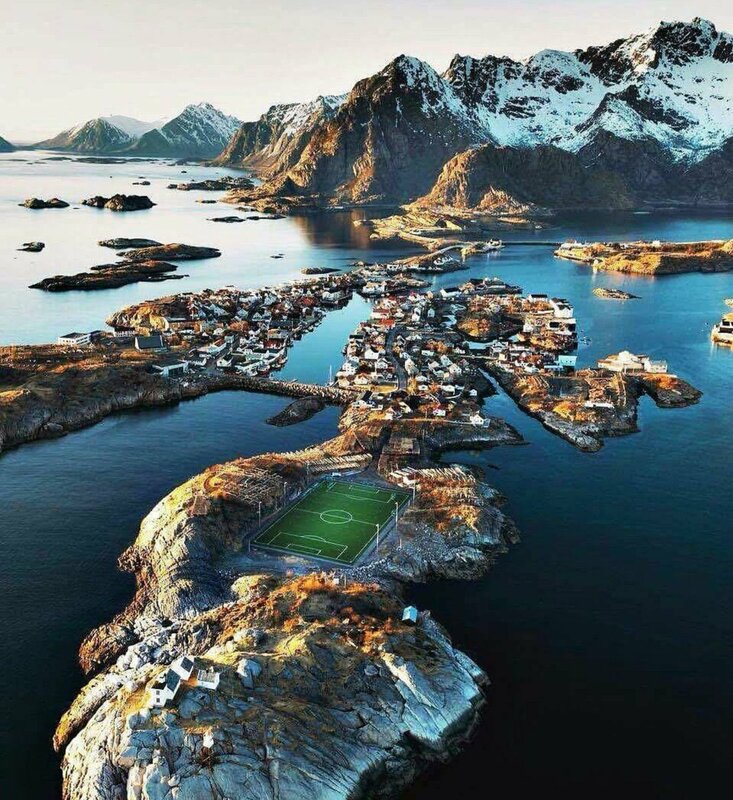 Pakistani Province Baluchistan is gifted with a diverse landscape. 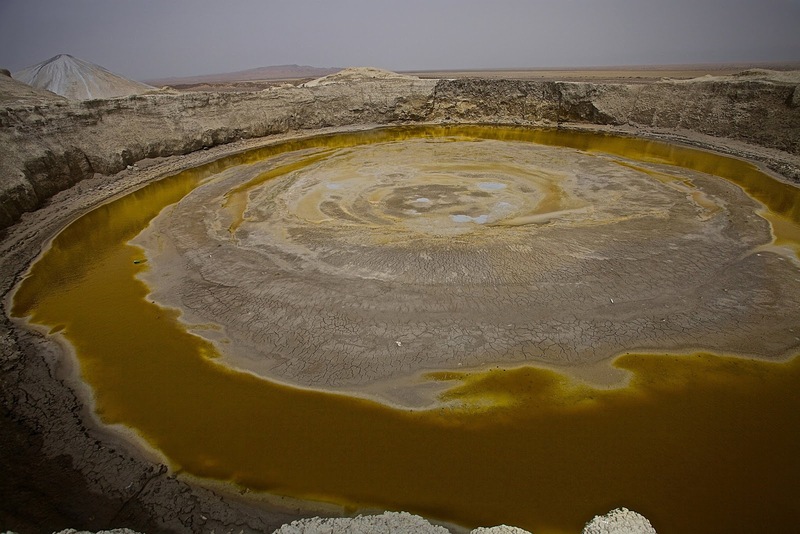 Among many geological wonders here, one big attraction is the presence of numerous mud volcanoes. Baluchistan has more than 80 active mud volcanoes in the Miani Hor-Hingol Valley region. 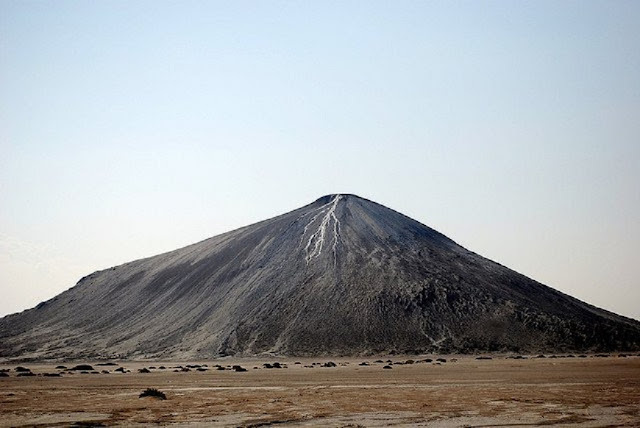 Chandragup Mud Volcano is most famous mud volcano, also called Chandar-Gup or Chandrakup. The highest Concentration is just three hours’ drive from Makran Coastal highway towards North in Hingol National Park, Baluchistan, Pakistan. Instead of lava, ash, and sulfur dioxide, these volcanoes spew mud and methane. On rare occasions, the gas plumes spontaneously ignite, shooting flames high into the sky. The Chandragup Mud Volcano height is between 800 to 1500 feet. Mud volcanoes hold clues to underground mineral resources, not to mention important geological and seismic information. It is considered the holy place of Hindus devotees who like to stay here for pilgrims on their way to the shrine of Devi Hinglaj. This is also a potential tourist attraction for adventure junkie. Another word which locally mentions this group of volcanoes is ‘Chandra coop’ which means Volcanoes of the Moon. Mud volcanoes have roots that go several kilometers underground and act as safety valves for high underground pressure. Mud volcanoes are generally not considered to be hazardous. 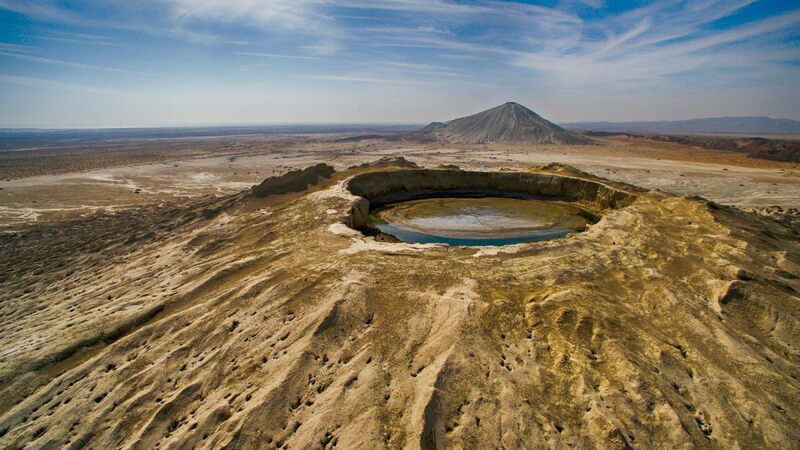 Azerbaijan has the largest concentration of mud volcanoes in the world. Scientific studies out in this area and find the presence of huge deposits of methane underneath the surface. Unfortunately, the gas deposits are in a solid form called methane hydrates. 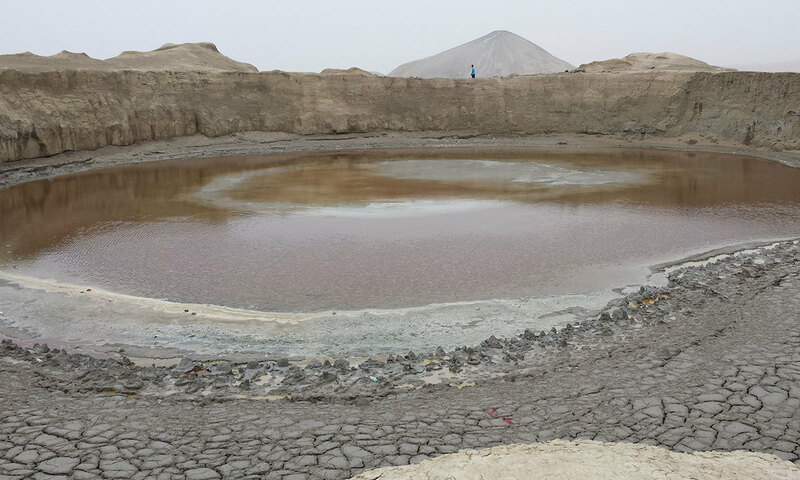 Perhaps in the future, the mud volcanoes might answer Pakistan’s energy needs. 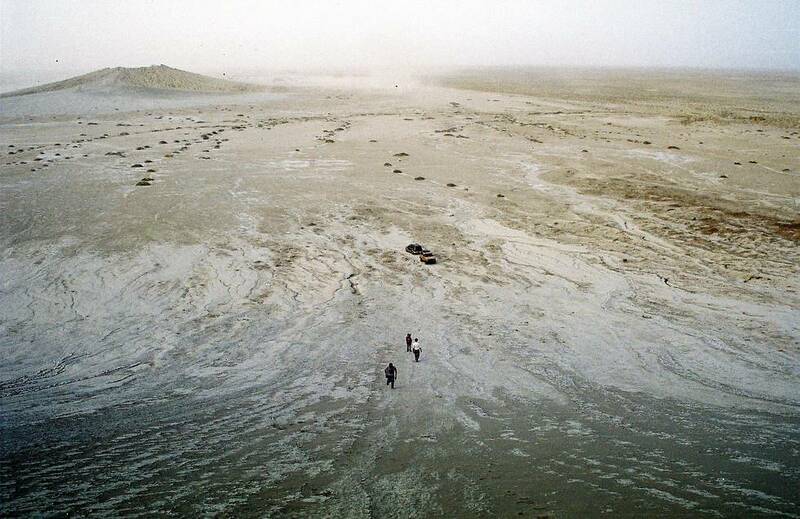 Dirt tracks leads to Chandragup Mud Volcano, only navigable in 4x4 vehicles. It is extremely hard to track here due to tiny sand flies. Who winged gnats seek exposed skin and their bites leave large, red itchy bumps that may turn into a rash. According to some claims, Chandragup mud volcano in Jhal Jhao tehsil of Balochistan is the largest and highest volcano in the world. Moreover keep in mind that these sandflies are notorious to carry a host of viruses and people are known to have died from complications arising from sand fly bites. The individual should be fit enough as far as physical condition and vehicles is well equipped. This is extremely remote location and isolated from civilization, so no chance of rescue if required. 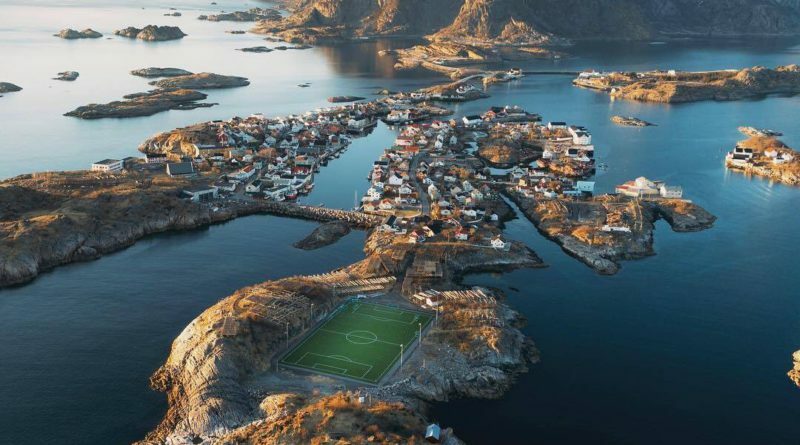 Make sure, no mobile service available within 50 kilometers in any direction. Another famous Mud volcano “Jabl-ul-Ghurab” is very close to Chandragup. Moreover, ancient Hindu temple ‘Hinglaj temple’ or ‘Nani Temple’ is also located near to Chandragup Mud Volcano. 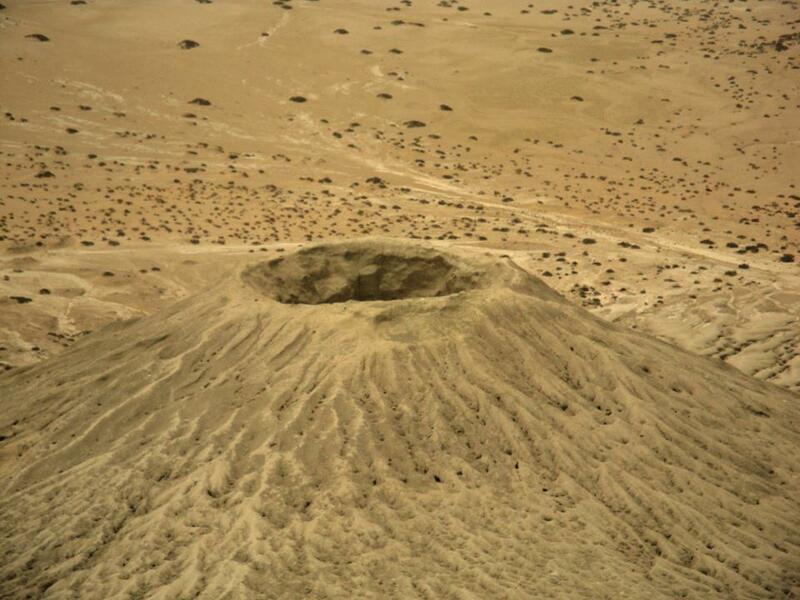 It is reported that during the infamous 8.1 intensity earthquake of Balochistan which occurred on May 31, 1935 a mud volcano erupted Northwest of Quetta, near the town of Surab and kept spewing out mud for 9 hours continuously. 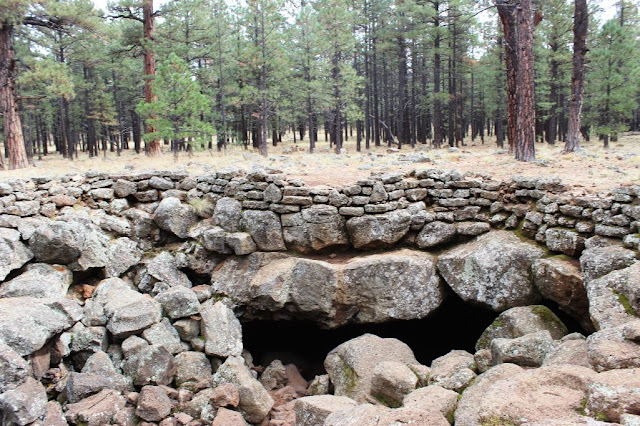 The Coconino Lava River Cave in the Coconino National Forest, near Flagstaff, Arizona is huge big enough for an individual to walk through with dozens of feet overhead. 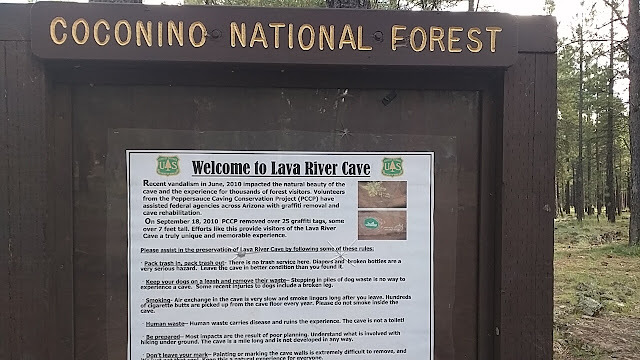 Coconino’s Lava River Cave is striking, telltale circumference of a lave tube which is more than mile long through solid rocks. Therefore, potholers won’t find stalactites or stalagmites beautifying this hall of echoes just the even arch formed by liquid-hot rock as it traveled through. 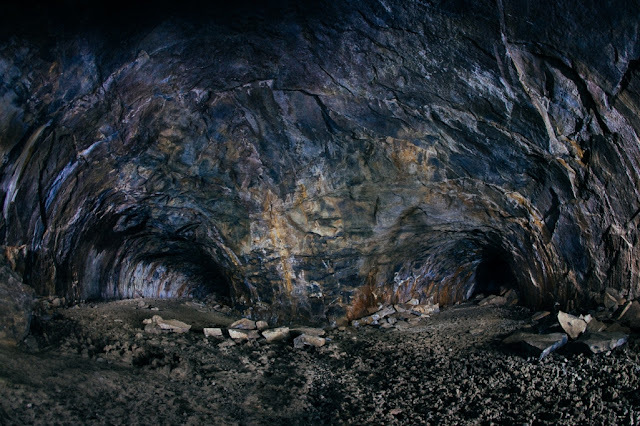 The cave can range in height from 30 feet and no light sources inside. 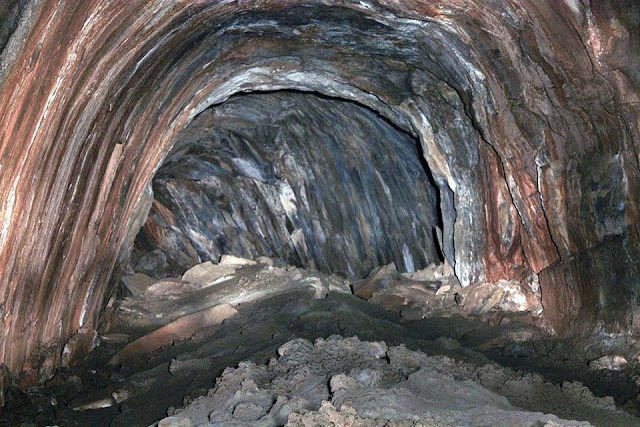 The all of a sudden smooth surface area can actually be dangerous, due to difference in temperature between the cool subterranean cave and the hot desert above ground, condensation frequently forms and makes the walls and floors of the Lava River Cave very slick. Coconino’s Lava River Cave isn’t the only lava river cave in the world, nor is it the largest even though it fascinating visitors and geologists alike a unique (Y-intersection) deep within the tunnel. Here is two enormous tubes combines into one, forming an exclusive Y-shape out of three indistinguishable tubes. So, this leads to a dizzying mirror effect that can occasionally be disorienting to inexpert explorers. 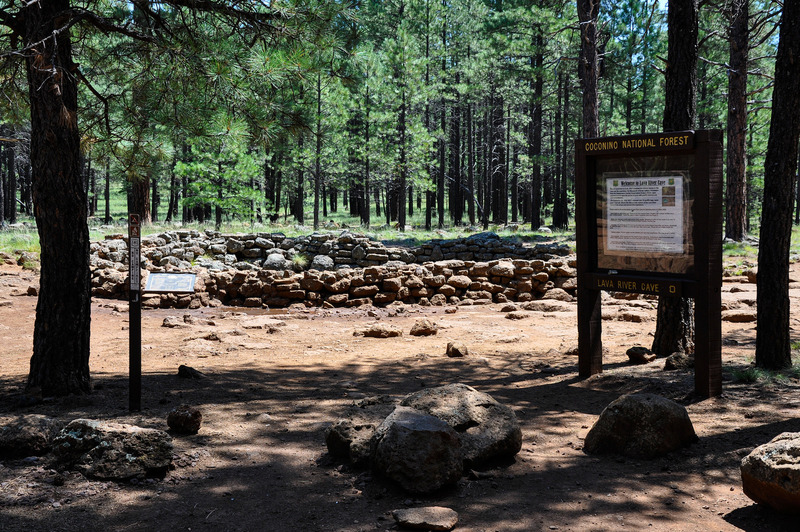 The Coconino’s lave river cave was unearthed in 1915 by some lumbermen and named it “Government Cave”. 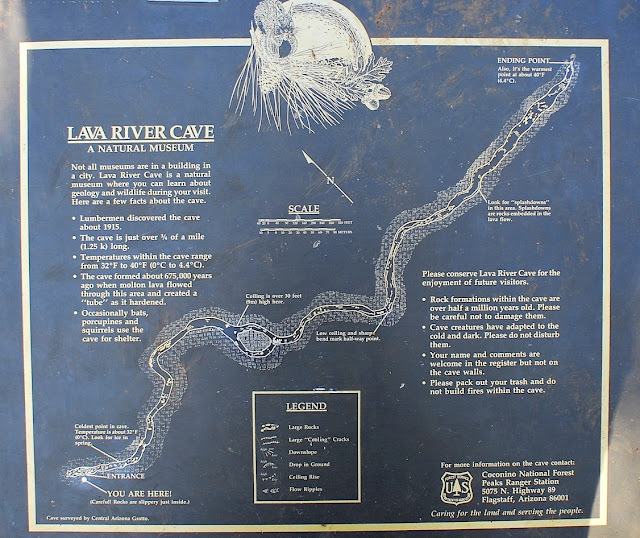 The cave was historically been referred to as “Government Cave” due to its location on the eastern edge of Government Prairie and southeast of Government Peak. Lava River Cave is freely accessible to the general public. Many peoples in the area still call its historic name. 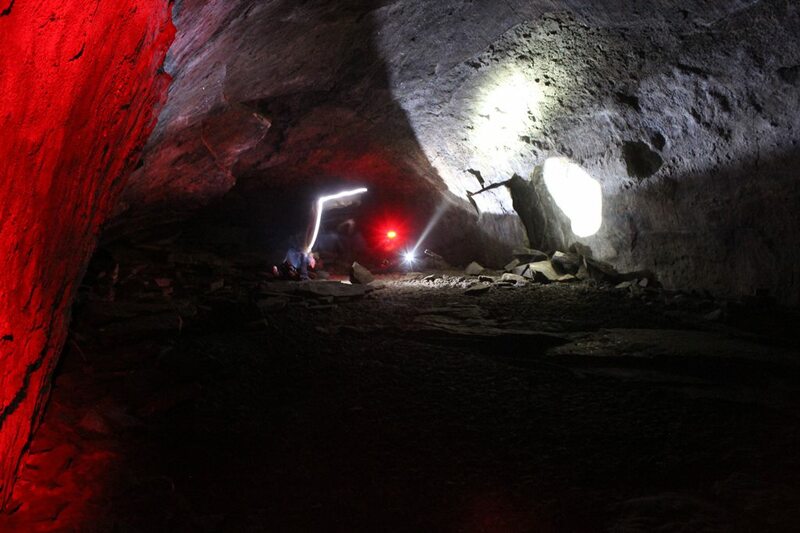 The cave is very close to the surface above ground, with holes punctuating the ceiling at times, creating a surface treacherous for walking, but providing beautiful pillars of light from outside while traveling within it. 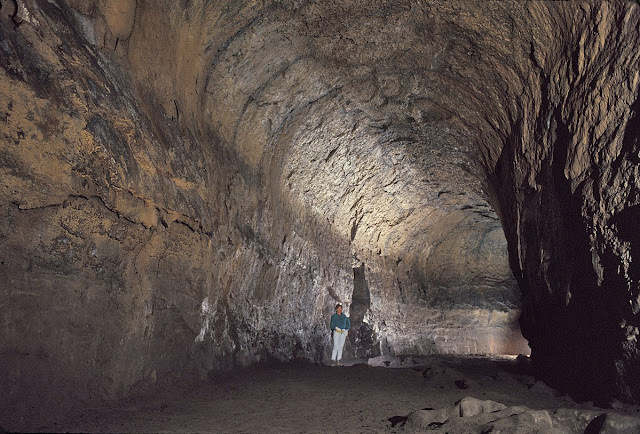 This makes the Lava River Cave one of the most striking subterranean sites in the western United States. 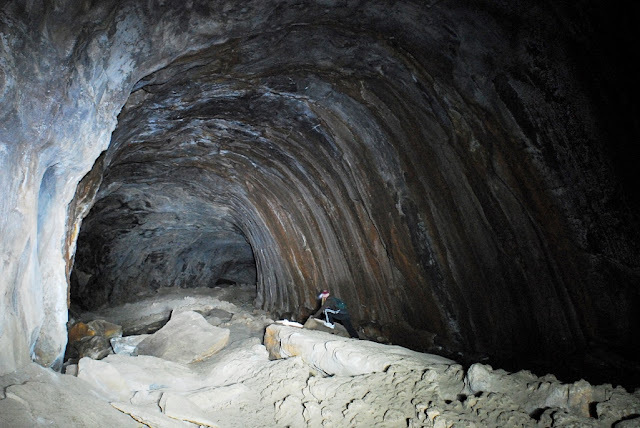 It is believed that cave was formed sometime between 600,000 to 700,000 years ago. The molten lava erupted from a volcanic vent in adjacent Hart Prairie. Therefore, the top sides and bottom of the flow cooled and solidified. Whereas lava in the middle flowed out, leaving a hollow space to form the cave. Of all these intriguing curiosities, most interesting for adventurers is surely the lava tube long, cave like passages underground, arching in a near-perfect circle so ideal for traveling through, one might think they were man-made. 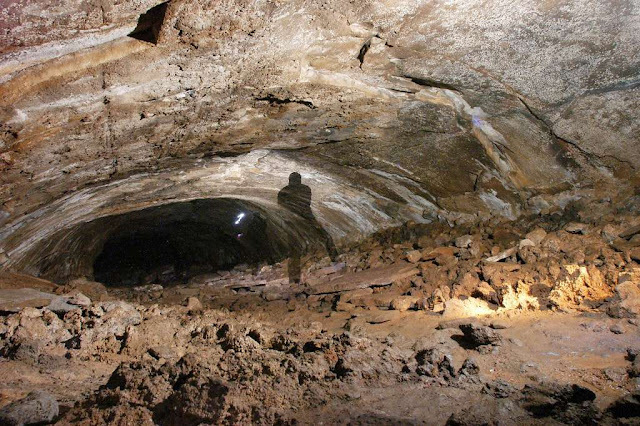 These caves were formed millennia ago as the outside of a giant lava flow hardened, but a still-liquid center traveled through it like an underground river. Until the river stopped, leaving behind a circular tube unlike any other naturally-formed subterranean cave. Thus due to the temperature change, there is a lot of condensation on the walls, ceiling and floor near the entrance, which makes it slippery. The temperatures inside cave are around 40 °F during the summer, and it is not rare for some of the rocks to be covered with ice. 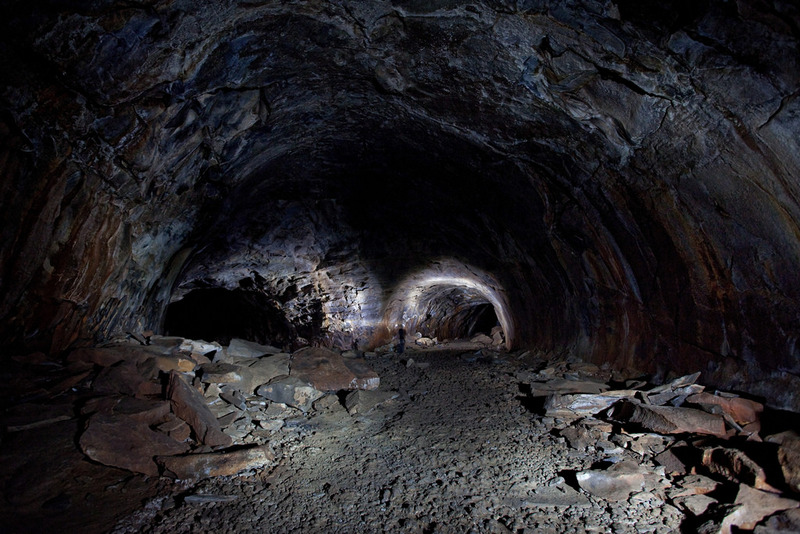 The cave is mostly dry so, bring water and at least two to three sources of light, wear warm clothes and sturdy hiking boots with ankle support and protection. Please keep in mind that this is a remote wilderness site with no services.